102″ x 4″ (2600mm x 100mm) diameter. 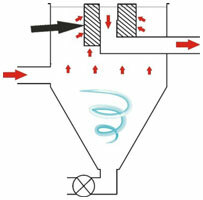 Vortex chambers are good for settling out heavy waste but much less efficient with the lightweight particles. Have you noticed that even though you get a lot of waste in the bottom of your vortex, you still find that the subsequent chambers get very dirty too. This is the very fine particles that do not have time to settle in the vortex and so they get drawn through the transfer port into the next chamber. 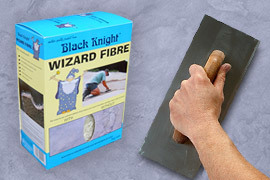 Black Knight brushes work in three ways. First, they physically trap the large particles that cannot pass through the close weave of the interlocking filaments. 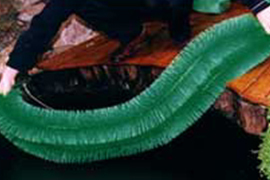 Secondly, the filaments have a static charge that ‘grabs’ any small particles that are flowing by. This charge holds onto the waste until you do your routine cleaning. Thirdly, after you have been using the brushes for a few weeks, the massive surface area of the brushes becomes home to millions of beneficial nitrifying bacteria that will help to purify your water biologically. Simply insert a vortex brush in the path of the flowing water and you will be amazed at how much waste is collected in a short time. 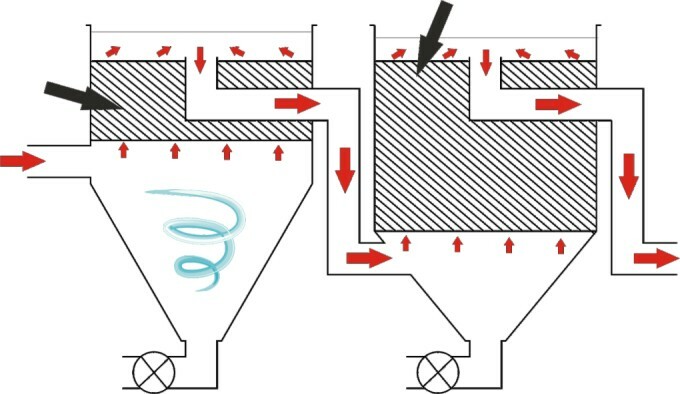 If your second and subsequent chambers are already full of media then you can use either one vortex brush strategically placed around the transfer port or you can use several to build up a barrier of them above the inlet of the vortex and below the outlet (assuming that your vortex is designed in this way). This will allow the heavy waste to drop to the bottom of the chamber and then all the waste that does not settle is forced to pass through the brushes thus allowing it to be caught. 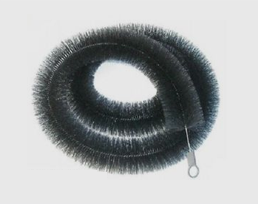 You can coil one or two vortex brushes around the outlet so that the water has to pass through the brushes. 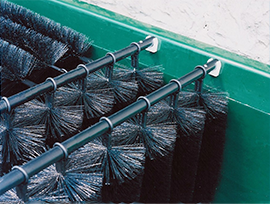 Vortex brushes can be used in as many chambers as you wish. 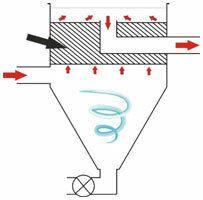 It is a good idea to leave some room in the first chamber to allow for settlement but subsequent chambers can be filled with vortex or filter brushes as shown. The frequency of cleaning will depend upon the size of the filter relative to the pond size and also the loading on the system i.e. the bodyweight of fish in the pond, how much they are eating and how much dust and plant debris is being produced. The rule of thumb is – the more often you do your cleaning, the cleaner your pond will be. On a lightly loaded system then once every three weeks in the warm months may be sufficient but twice a week may be necessary on a heavily loaded system. Brushes can be cleaned in-situ if you wish. Simply drain the chamber and then rinse the brushes by pouring buckets of pond water over them. Alternatively, you can take the brushes out, clean and then replace them. You can use chlorinated tapwater for cleaning them but you will temporarily reduce the biological effectiveness of the brushes with this method.